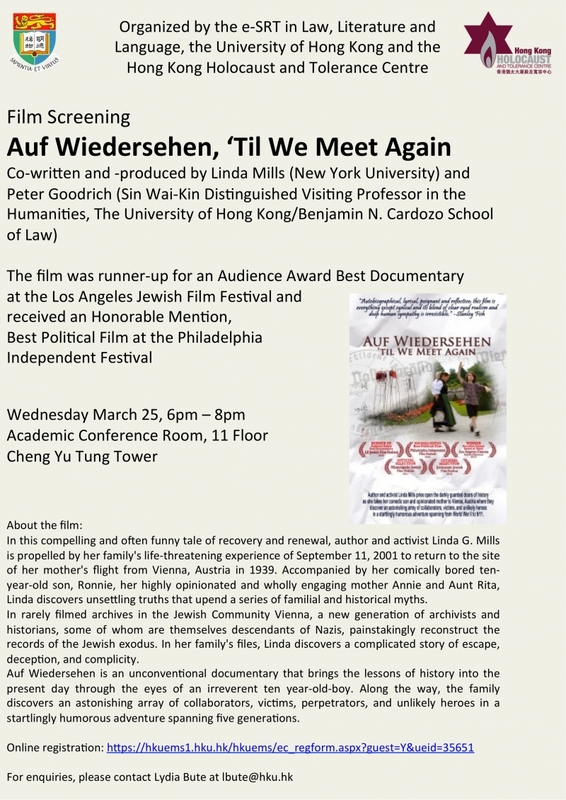 On March 25, 2015, HKHTC and the HKU Law Faculty hosted a special screening of Auf Wiedersehen, ‘Til We Meet Again. In this compelling and often funny tale of recovery and renewal, author and activist Linda G. Mills is propelled by her family’s life-threatening experience of September 11, 2001 to return to the site of her mother’s flight from Vienna, Austria in 1939. Accompanied by her comically bored ten-year-old son, Ronnie, her highly opinionated and wholly engaging mother Annie and Aunt Rita, Linda discovers unsettling truths that upend a series of familial and historical myths. Auf Wiedersehen is an unconventional documentary that brings the lessons of history into the present day through the eyes of an irreverent ten year-old-boy. Along the way, the family discovers an astonishing array of collaborators, victims, perpetrators, and unlikely heroes in a startlingly humorous adventure spanning five generations. Prof. Glenn Timmermans (Faculty of Arts & Humanities, University of Macau) moderated a post-screening discussion with Linda Mills (New York University) and Peter Goodrich (Sin Wai-Kin Distinguished Visiting Professor in the Humanities, The University of Hong Kong/Benjamin N. Cardozo School).